Day 3 of our exploring of Toronto consisted of walking down Queen St. West (in the cold and rain) to explore cute little stores that we had seen on our way to my aunt’s place. If you’ve ever been downtown Toronto on Queen St., the most popular parts are usually between Yonge and Spadina, where you can get your shopping on in big named stores. For the locals, as well as those that want to think outside the box, that stretch of town can be a little meh, especially since it’s always filled with tourists and teens who want to shop. We explored the West side of Queen St. to see if we could find a some stores that would spark our interest, and let us tell you… we did! And we think that you should go there too! Our trek started on the corner of Ossington Avenue and Queen St. West, where the street cars (right now bus since the street car railway is under renovation) would drop you off infront of a baby pink building with my favourite 4 letter combination: BYOB. BYOB Cocktail Emporium opened its doors back in 2011, and since then, has become a big name in the industry: as of 2016, it is the only store in North America that sells Japanese cocktail gear, as well as having the largest collection of bitters in Canada. 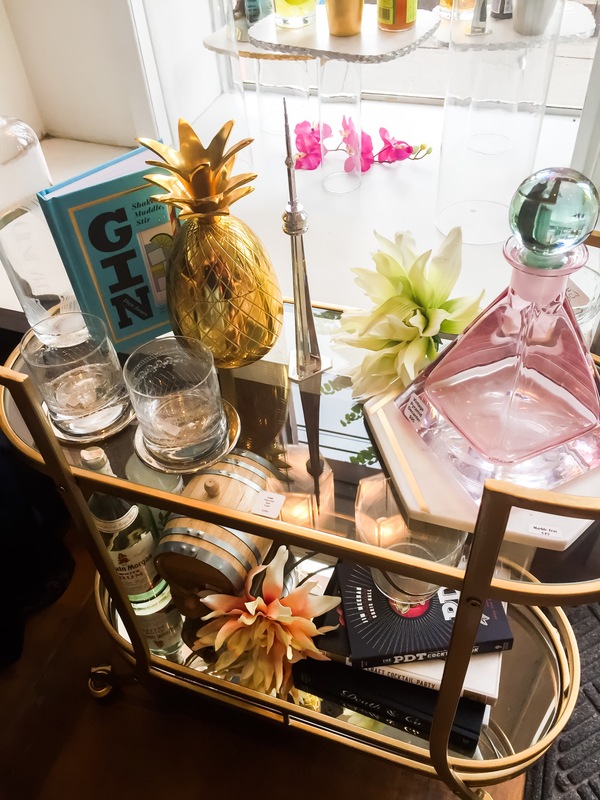 If you’re on the lookout for vintage bar gear, special ingredients, or wanting to glam your bar cart, BYOB Cocktail Emporium is the place to go! We wanted to leave with everything we set our eyes on, and clearly, pineapples are the it home decor accessory of the year! You can also find them in Kensington Market (1/2 oz. Cocktail Emporium) and online! Continuing down on Queen St. West, you will find a plethora of little stores and boutiques of all types: clothing, second-hand high end clothing, hand-made stationery and paper, home accessories, etc. Our second stop (and much needed stop) was right infront of the Trinity Bellwoods Park, at The White Squirrel. The White Squirrel is a small independent coffee shop that has been there for over 9 years, and has become a staple to the surrounding neighbors. It’s name comes from the legends of the White Squirrels that live in the park across the street. Apparently there are sightings of rare albino white squirrels in the park, and these squirrels have become somewhat of a mascot to the neighborhood. As for the coffee shop, the large front-of-store window actually opens up as a service counter, but when you walk inside, the back opens up into a fairly large mezzanine where you can side down and enjoy your coffee or get some productive work done. They were serving up some Mountain View Estates coffees, a torontonian roaster, which was D-E-L-I-C-I-O-U-S. I am proud to say that I’m a paper and pen hoarder. I love to collect beautiful pens and books, mostly for their attractive colours and textures. Somewhat of a magpie for colours instead of shiny objects. This place is for the paper obsessed. They have all types of papers, pens, and anything that you would need to complete your collection of stationery accessories. They even offer workshops on paper making, decoration, etc. A definite must! For all you foodies out there, we think that this spot is for you! 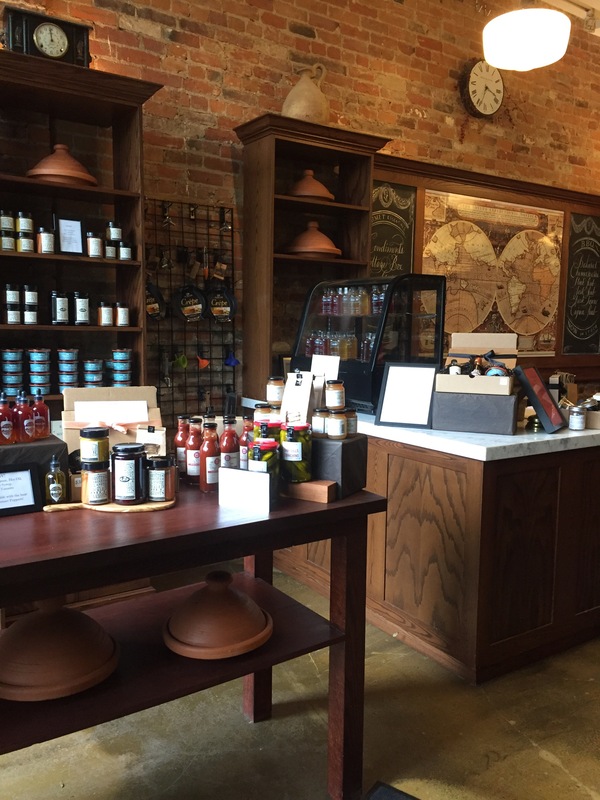 It has a slight ancient apothecary feel when you walk in, but everything is made out of gorgeous wood and well displayed…so well that you just want to open everything up and sniff! And you can! Many of the products are locally made, or made in Canada, with a few imports. You’ll find oils to spices, as well as teas and hot sauces. There are a selection of oils and hot sauces that you can taste, which is always great when you’re looking for a gift, or before you commit to that extra spicy hot sauce. Although there are multiple boutiques along the way, two in particular caught my attention, the first one being Hayley Elsaesser’s store. I first found Hayley Elsaesser on Instagram, since many of the Canadian (and other) celebrities I follow have been wearing her creations over the past two years. Known for loud and funky colors and prints, owning a piece or two from Hayley Elsaesser’s collection is becoming a must in any fashionista’s closet. I got lucky earlier this spring and got one of her cobra print dresses on sale, and let me tell you, people take notice! We happened to stumble upon her store, although I knew it was somewhere on Queen St. Her items fit true to size, and are what I would qualify as mostly gender neutral. You can definitely spot her creations a mile away, and keep an eye out for her on the Toronto Fashion Week runway! I admit, I walked into this store mostly for the name (I’m secretly a Zayn fan), but rest assured, this particular Zane is all about accessories. The accessories featured in the store are made by local and international artisans, and their mission is to offer you the best of accessories. Think investment statement pieces that will add some sass to your outfit, and be something that you can wear a thousand ways. From handbags to glasses, with jewelery and phonecases, you’ll definitely find something for that fashionista in your life. Known to many Canadians as the alley where Rick Mercer treks down while doing his nightly rant, Graffiti Alley should be on your list of things to do. It is constantly evolving, displaying local talent and art, and is also a great place for photoshoots. Speaking of which, we perhaps photobombed a few engagement picture shots while trying to find the exact spot where Orphan Black filmed scenes involving Felix’s loft. We did end up finding the staircase, but it was boarded up and the graffiti has changed since they shot the show, so it was kind of a puzzle to solve! As for food and drink, there were so many options that will please everyone, so just keep an eye out for that one shop calling your name.